A solid week in New Orleans is only a fraction of the time you need to eat your way through the city and while I didn't have a single disappointing meal, these are the culinary highlights of my trip. What you need to know: DC's is only open for lunch (11-3), but I've heard tell that they are starting Friday night dinner service. Still, double-check Yelp or something before venturing out for dinner. Oh, if you're used to dining in very middle-class suburban or downtown restaurants, the neighborhood will seem kinda sketch. It's in the Treme (I think) and the recovery from the flood is slow and on-going. Never fear, you're perfectly safe here for lunch. We walked passed it numerous times during our walkabouts with nary a problem. Janette Desautel: "They have sandwiches in New York, Davis." Davis McAlary: "Po'Boys aren't sandwiches, they're a way of life." Indulge me for a moment while I honor the Po'Boy and what makes them special -- these are hoagie rolls unlike anything you've ever had. They are light and crisp. The crust isn't crusty -- it's more like a thin crispy shell. It's easy to bite through, unlike ciabatta or some other italian rolls, but it's not spongey or soft. Fluffy and crispy (and heaven-sent) is the best way to describe them. I don't know if it's the water or the flour or just the know-how, but I would give my left pinky toe to get rolls like this at home. Located in the Bayou St. John (about a mile from the Museum), the Parkway Bakery is a bit of heaven on earth if you love Po'Boys the way I do. You can get Po'Boys with just about anything on them -- fried oysters, fried catfish, roast beef, even potatoes, so if you can think of it, you can put it on a Po'Boy. But Parkway's traditional Po'Boys are served with roast beef. It's not sliced roast beef: it's more like a brisket -- delicious, long roasted beef just falling apart in the gravy and then loaded onto the insouciant roll. Geargirl got the roast beef & fried shrimp combo, perhaps the most unusual sandwich pairing I've ever had. Meanwhile, I opted for the fried catfish Po'Boy. The fish was perfectly cooked and the lettuce, tomato and pickles (with a healthy dose of hot sauce) are perfect additions. What you need to know: Parkway is closed on Tuesday. They have plenty of outdoor seating. Don't fret if the line is long -- it usually moves pretty well and it is well worth the wait. There is a small bar if you want a cocktail, but Barg's rootbeer in a glass bottle goes very well with your Po'Boy. Liuzza's by the Track. I'm not a huge gumbo fan, even though I pretty much love all things New Orleans and this is a huge New Orleans thing. That is to say, I wasn't a big gumbo fan until I went to Liuzza's by the Track. Now I know what all the fuss is about. 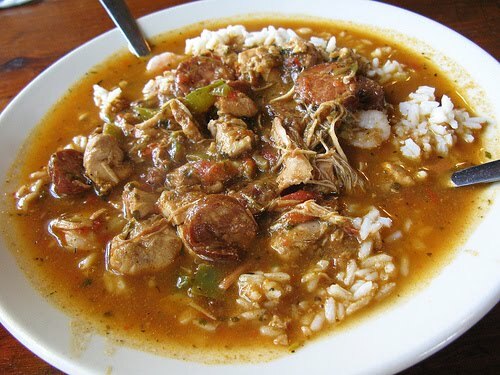 Liuzza's gumbo is brothy rather than thick, and the roux is dark and peppery. It's not peppery in a tabasco or hot sauce kind of way, either. It's peppery in a ... well, if you could make yourself a suit made of black peppercorns and once wearing that suit, you climbed inside a giant fresh bell pepper and rolled around for a while, that would come close to the flavor of Liuzza's gumbo. Then, of course, there is the intersection of pepper with chicken thighs and some of the smokiest smoked sausage I've ever tasted. It is magnificent. The other food at Liuzza's is great, too. Geargirl got the fried oyster Po'Boy with garlic butter and, as it was Monday, I got the red beans and rice. I can say, without a doubt, that it's worth a trip to Liuzza's no matter how short your stay in Nawlins may be. 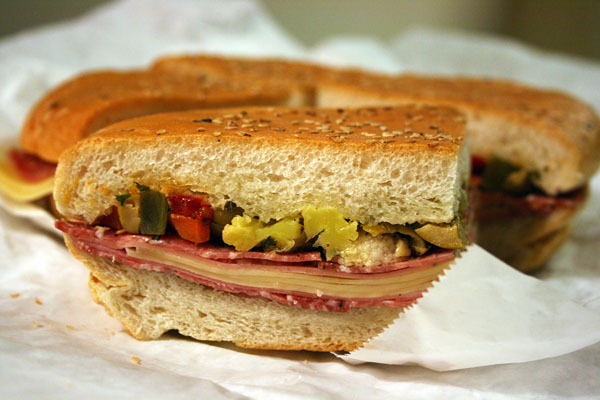 What you need to know: Liuzza's is in Mid-City. 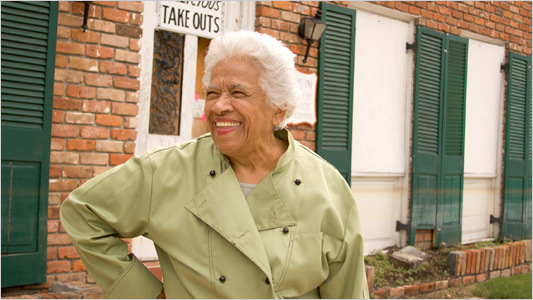 If you're staying in the Quarter or in hotel row along Canal Street, and if you like walking, cut through the Quarter to the Marigny and walk up Esplanade. It's a very pretty walk, too. They're not open late, though. So go for lunch or an early dinner. Also, it's pretty small -- so don't go at peak lunch time or you'll have a long wait. Central Grocery. This is the only spot in the French Quarter to make my list. I'm probably about the 40,000th person to wax poetic about the muffalettas, but no matter what you've read or heard, it doesn't do justice to the Central Grocery muffalettas. A muffaletta is a huge round sandwich loaded with salami, mozzerella, provolone, mortadella and this amazing olive salad. I've even attempted making my own muffalettas and I have to say, they were good, but still not the unique experience of CG. Escape from the Hegemony of the Overly-Hopped Beers. Abita Amber is the traditional every day beer of New Orleans (and it's pretty yummy, particularly when its really chilled), plus I tried the Ponchatrain Pilsner from Covington. It was delicious -- a proper German style pilsner, crisp and clean. 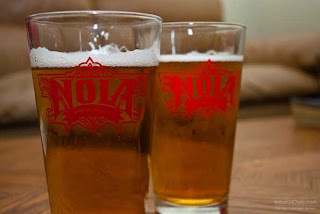 But the highlight of the trip, and the beer I drank most often, was the NOLA Blonde -- an ideal beer for me, a clear, clean beer with a bit of bite and tons of body. NOLA Blonde was perfect accompaniment to any musical occasion -- from the amazing gift of Big Chief Smiley Ricks hosting Indian practice on Frenchman Street, or lucking into the Pine Leaf Boys playing on our first night in town, or getting caught up in the sublime insanity of Glen David Andrews. 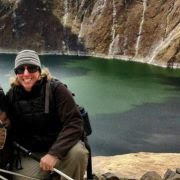 To NOLA's head brewer Melanie Knepp, I raise my beer stein! Huzzah to NOLA Blonde. -- Happy hour oysters at John Besh's new joint Luke. This is important people -- you get a dozen oysters for just $6 from 3:00 to 6:00 daily at Luke. They go really well with the in-house beer -- the Luke Fru. -- Bisquits as big as your head with fresh jam, or shrimp & grits for breakfast at Cake Bakery in the Fauborg Marigny. This place was right around the corner from where we were staying, but we didn't go there until our second to last day. Needless to say, we went back our last morning. Oh, the endless coffee is a nice touch, too. -- Jambalaya & Greens at The Praline Connection, also in the Marigny on Frenchman Street. Don't get any specials -- just get the jambalaya & greens. Also, try the fried okra, which is listed as an appetizer, but is big enough for about six or maybe even eight appetizer portions. Take some friends and get some. Worst. Pittsburgh. Sports. Week. Ever.